The “official “state stone” of Michigan is the Petoskey Stone, the local name for rounded pebbles or cobbles of the fossil coral Hexagonaria percarinata Stumm, 1969. Petoskey Stones have been weathered & eroded from fossiliferous limestones of the Traverse Group (Middle Devonian). They are particularly common in the vicinity of Little Traverse Bay & the town of Petoskey (northwestern Lower Peninsula of Michigan). Beach & lake gravel in this area consists of many lithologies, including fossiliferous limestone clasts and worn fossil corals (favositids & colonial rugosans). 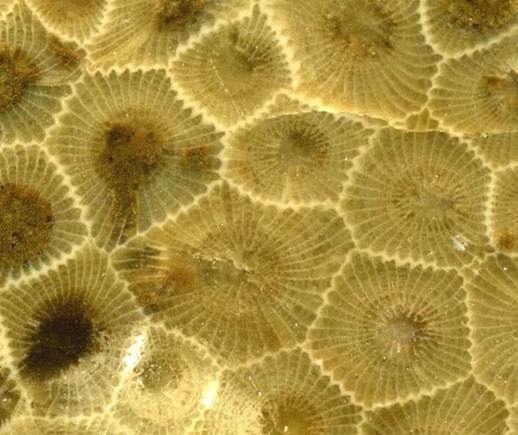 Hexagonaria is a colonial rugose coral (Animalia, Cnidaria, Anthozoa, Rugosa, Phillipsastraeidae). Hexagonaria percarinata (field of view 3.2 cm across) - “Petoskey Stone”. 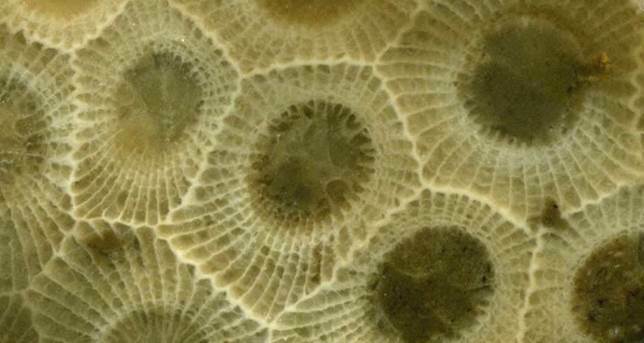 Hexagonaria percarinata (field of view 2.6 cm across) - “Petoskey Stone”. The city of Petoskey, Michigan gets its name from an old Ottawa Indian Chief, Ignatius Petosega. “Pet-o-sega” means “rays of the rising sun”. Petoskey Stones are so-named in reference to the dark-colored “eye” & radiating lines of individual Hexagonaria corallites.